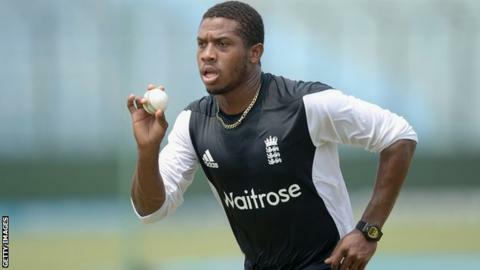 Bowler Chris Jordan expects Sussex to reap the benefits after cricket manager Mark Robinson was overlooked for a coaching position with England. Robinson was interviewed by the England & Wales Cricket Board but Peter Moores was chosen to lead the national side. "Robbo is a very good coach and man-manager. England would have benefitted immensely from his enthusiasm and passion," Jordan, 25, told BBC Sussex. "I guess England's loss is ultimately Sussex's game." Since taking charge at Hove in 2005, former Northamptonshire, Yorkshire and Sussex bowler Robinson has won the County Championship twice and led his side to four one-day trophies. The 47-year-old has previously coached England Under-19s and led the England Lions on a successful tour of Sri Lanka earlier this year. "You can see what he has done at Sussex thus far," Jordan added. "The environment he creates in and around the ground and in the dressing room is second to none. "Robbo staying means stability at the top. Hopefully with that and the ideas he brings to the table we can really kick on and challenge for some trophies at the business end of the season." Barbados-born Jordan was handed an incremental contract by the ECB last month after impressing for England over the winter and he is now targeting a place in the Test side this summer. The fast bowler has played in seven ODIs since his debut in September, taking nine wickets, with eight T20 wickets in six matches. "It was a solid start to my international career and I hope I can continue that this summer," he said. "Playing Test cricket is probably your ultimate aim. "I have got a go in the one-dayers and T20 thus far but If I can put in some good performances in Championship cricket leading up to that first Test [against Sri Lanka], hopefully I can be one of the names on the team sheet."